Bucks Drop Second Game of Home and Home ~ The Bucky Channel - The World of Sports from Wisconsin's Perspective. Winning home and homes in back to back nights are always hard, but as well as the Bucks have been playing lately this should not have happened. 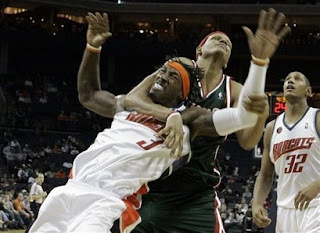 The Bucks dropped a game tonight 102-92 to the (12-22) Charlotte Bobcats one night after beating them by 25 at home. The Bucks (16-19) still hold the 8th seed, and while still being a CURRENT top 10 team in the NBA still have a few things to work on. By the way, Charlie V played the flagrant foul off in the photo above about as cool as Tom Cruise's pool cue moves in the Color Of Money. Off topic, the only thing cool about that movie is Paul Newman and maybe the soundtrack. End of story. Sorry, I just cannot take Cruise's "VINCE" shirt, bouffant hair, Rick Vaughn glasses, samurai cue moves and his woman screaming, around the 1:25 mark of this video, seriously. The total Bucks story wasn't as evident in the Box Score as usual. While the Bucks out shot, percentage wise, and out rebounded the Bobcats they still lost. Those two are usual marquee stats in the outcome of the game. The stats evident to the loss were the 4 more three point shots made and the 8 more free throws sank than the Bucks. It's hard to be disappointed in tonight's effort, because the Bucks out shot the Bobcats but while only losing the turnover battle by 2 the Bucks did commit an embarrassing 17 turnovers. The leading scorer for your favorite team tonight was Richard Jefferson with 19 points. Redd, Ridnour and Bell all eclipsed the double digit mark. No player had over 7 rebounds or 5 assists. Bogut sat the game out after fatigue, or "back spasms" had set in from playing 40+ minutes in back to back games against San Antonio and Houston. Skiles limited Bogut last night in the blow victory but clearly felt that Bogut could use the extra rest. To be honest, who could fault Skiles, the Bucks absolutely annihilated Charlotte last night with Bogut seeing limited action, why not tonight right? While Danny G did have a decent night, especially on the defensive end with 3 blocks and a steal, he just doesn't bring the offensive presence that Bogut does. Even when Bogut is as cold as ice he still demands the occasional double team which frees up other Bucks to do their thing. Milwaukee gets the disappointing Toronto Raptors (13-20) Monday night. The game will take place in Milwaukee at 7:00 pm and will be on FSN Wisconsin. TBC's Buck of the Game: Richard Jefferson - 19 points, 7 rebounds, it wasn't a pretty one statistic wise.